And your Chapter Chair, Nancy Schimkat, was also elected along with 11 others in Germany to be a DPCA Representative. This means that she will represent Germany at the international level of Democrats Abroad. 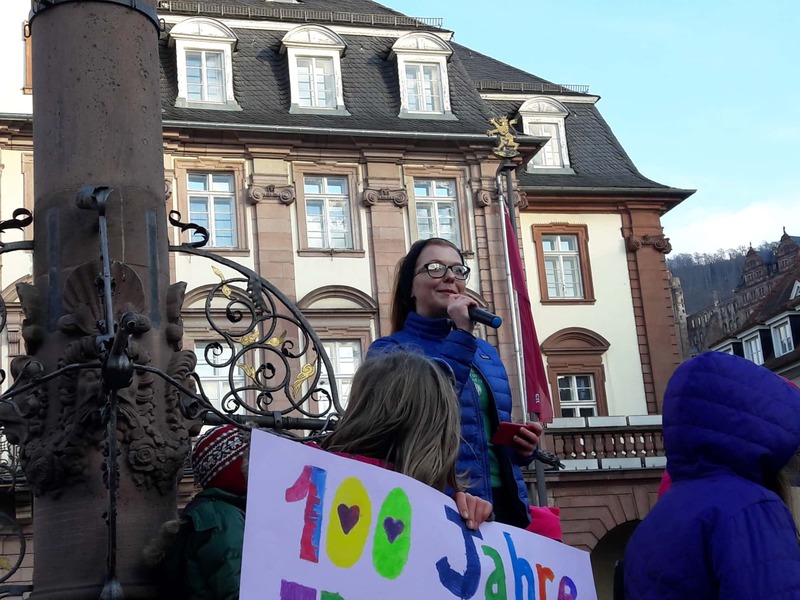 Heidelberg was once again the location for one of the many Global Women’s Marches, with about 400 marchers showing up in 2019. 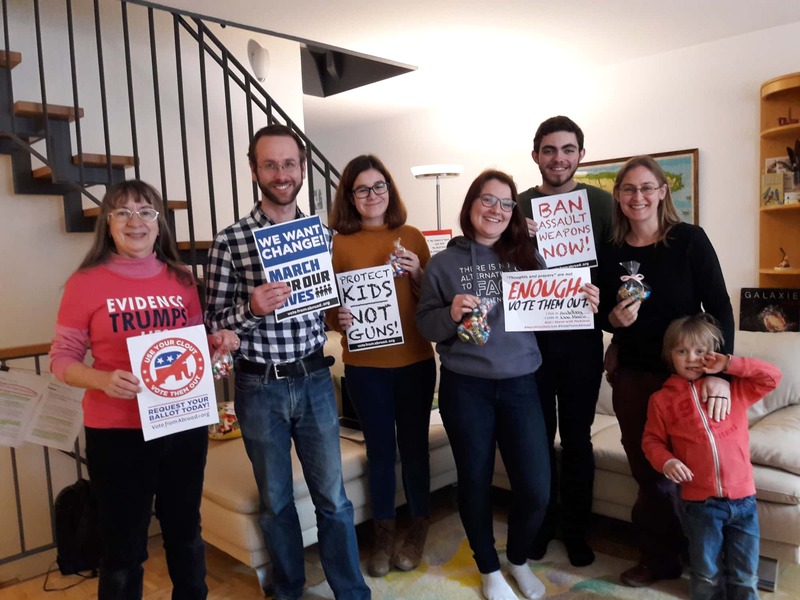 Democrats Abroad members from Stuttgart and Wiesbaden came over and joined us, adding to the enthusiastic support by Democrats Abroad in this March. 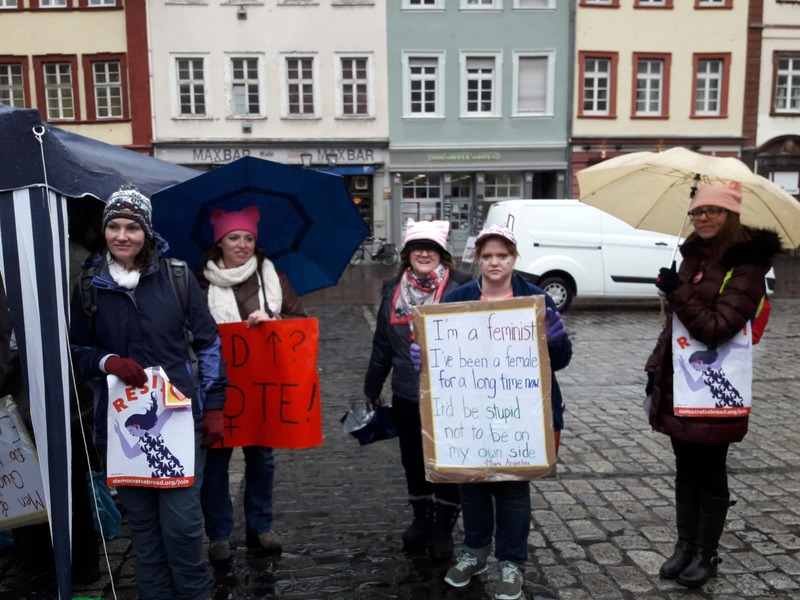 The Global Women’s March theme this year addressed “Violence Against Women” as a major and ongoing issue, and Democrats Abroad, while supporting that theme, also focused on efforts to finally get the ERA ratified in the United States. 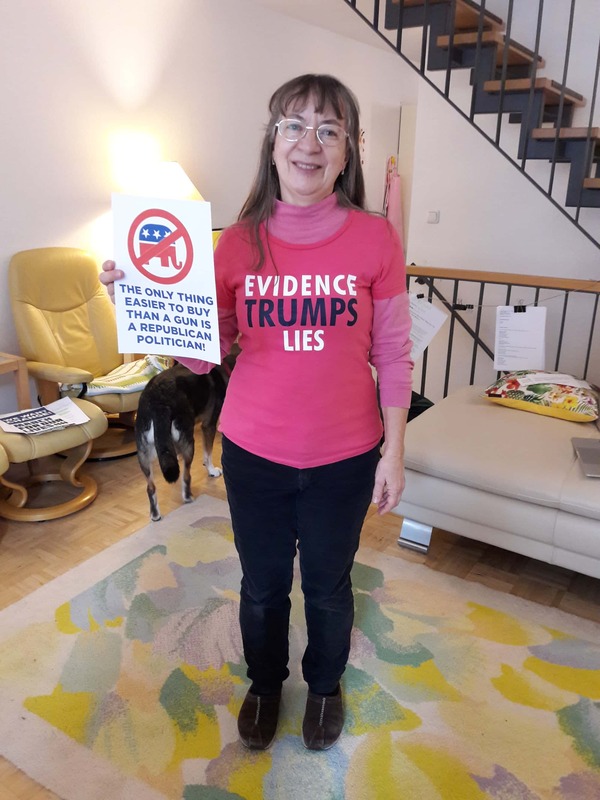 Speaking to that topic at the Women’s March was Democrats Abroad Communications Coordinator Amanda Mohar (pictured here). My name is Daniel Hoever-Eckardt. I’m 33 years old and I was born in Germany to a European mother and an American father. I’ve been a member of the DAHD chapter since 2016. Since the beginning of last year I’m a precinct captain for our newly developed Mannheim group. 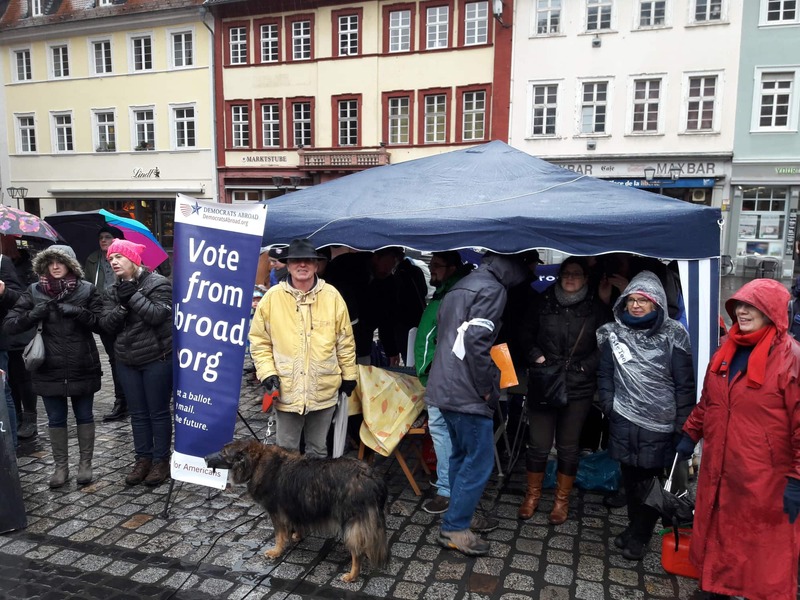 With the Mannheim group we are having quarterly meetings and organized a GOTV table in front of the Mannheim Stadthaus and marched in the CSD Parade in Mannheim. 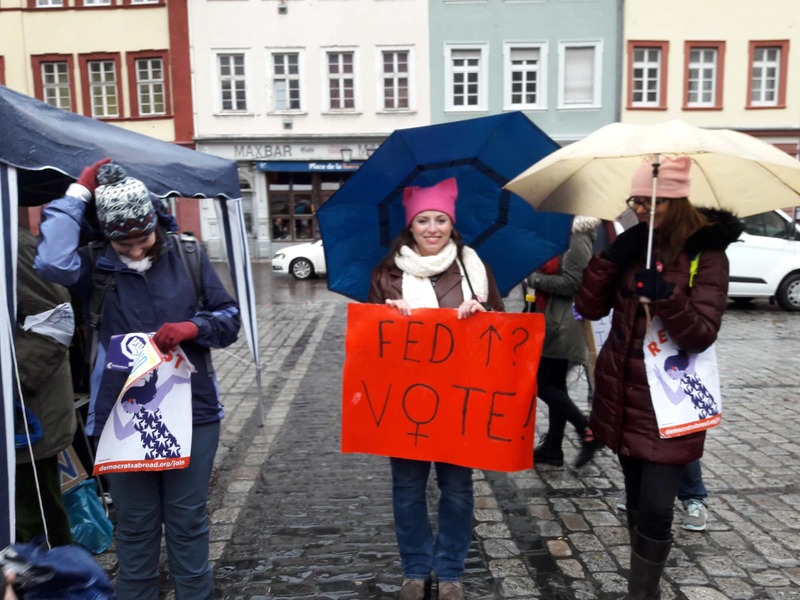 I also was actively helping at many of the chapter’s political and non-political events, like the Independence Day BBQ, Women’s March, Heidelberg Science March and others. Therefore, I would like to ask for the honor of serving as your chapter vice chairperson. My name is Nancy Schimkat. I’m 56 years old, and made Germany my adopted home in 1997. I’ve been a member of the DAHD Chapter since 2009, and am its current Chair. 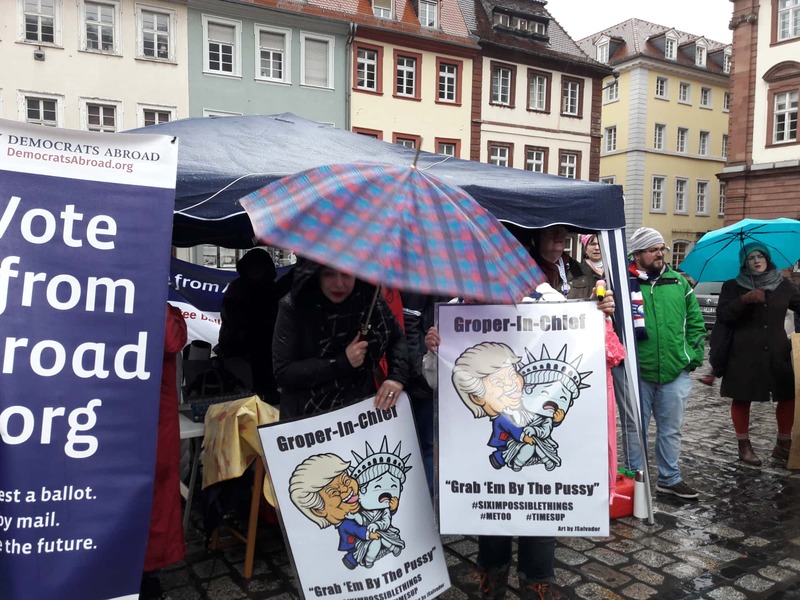 Over the past two years, our Chapter has added Mannheim as a Precinct and has started a group in Karlsruhe. We have been very active in creating, or participating in, events, and have successfully carried out fundraising for DA Germany. Our Half-Marathon was a particularly successful fundraiser. We have had impressive turnout at our non-political events, like movie nights, Independence Day BBQ and a holiday party in 2017 (we didn’t have a venue for this in 2018). 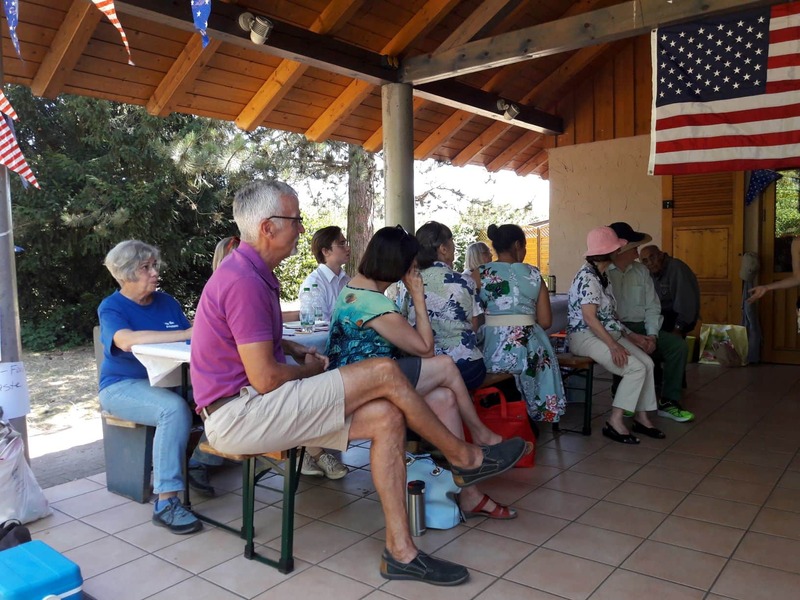 I would like to continue to provide opportunities for our members to engage with each other in such settings, and have ideas for other types of get-togethers as well. 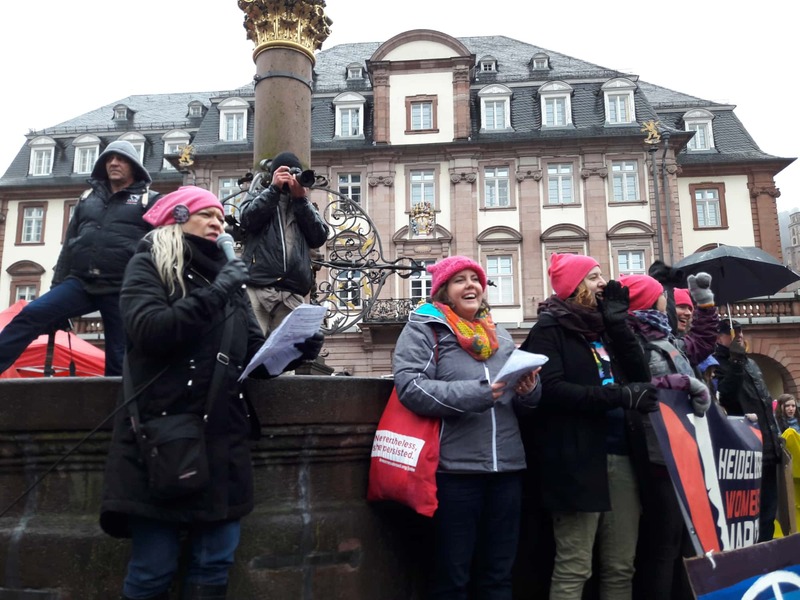 Our political events have included helping with and participating in the Women’s Marches, the Heidelberg Science March, the CDS Parade in Mannheim and a March for Our Lives Virtual March, in which 20 activists met and wrote over 200 correspondences to business and political leadership regarding gun control. 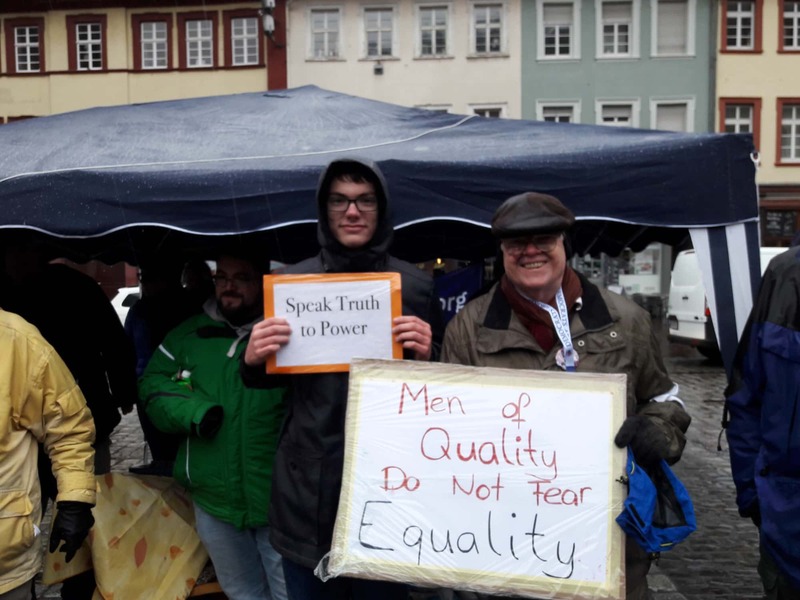 In February 2019, our Chapter will be hosting the Germany AGM. All of these events are possible because of the amazing active members of our Heidelberg Chapter. My job is simply to organize and bring people together. We have a great team! Therefore, I would like to ask for the honor of serving another two years as your Chapter Chairperson, starting in February 2019. Heidelberg Chapter's Busy Summer 2018! Heidelberg Chapter had a busy summer 2018. 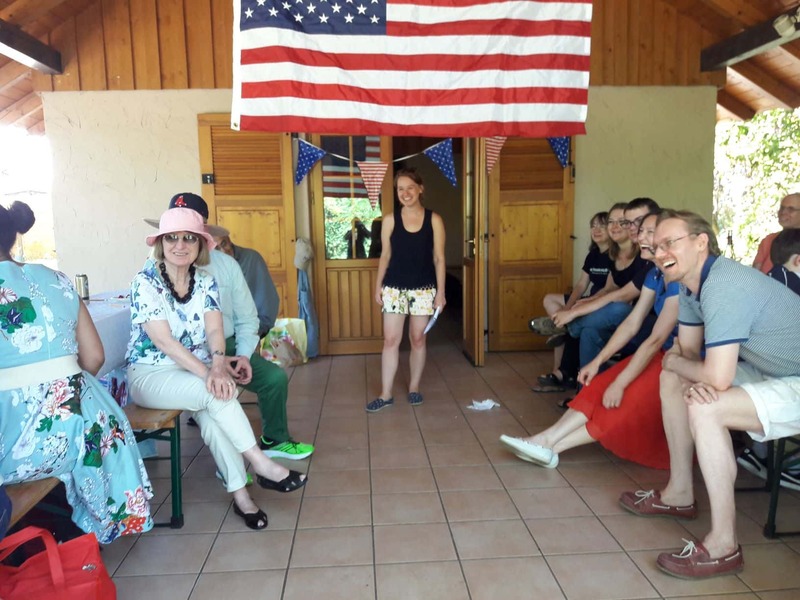 In July, we had our annual Independence Day BBQ, with good weather, a great turnout and plenty of good food and drink! In addition to water balloons and a pub quiz, we took turns reading the Declaration of Independence aloud, and then we had a lively discussion about it. In August we went to Mannheim and marched in the Christopher Street Day Parade. An estimated 120,000 bystanders were there! We had lots of fun and supported our LGBTQ friends at the same time. Twice we had street stands in Heidelberg to register U.S. voters and help people request their absentee ballots. 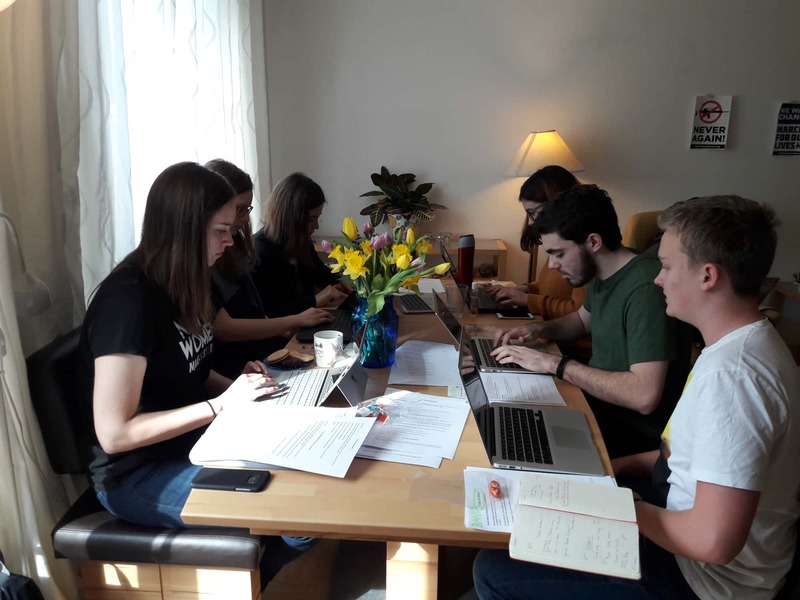 Meanwhile in Karlsruhe, some dedicated members formed a phonebanking group to call Americans in Germany to encourage and help them request their absentee ballots. And naturally, we also had our First Friday monthly meetings at Zum Achter Restaurant. Come join us if you haven’t already! Here are some photos . . .
Be Sure to Request Your Absentee Ballot! 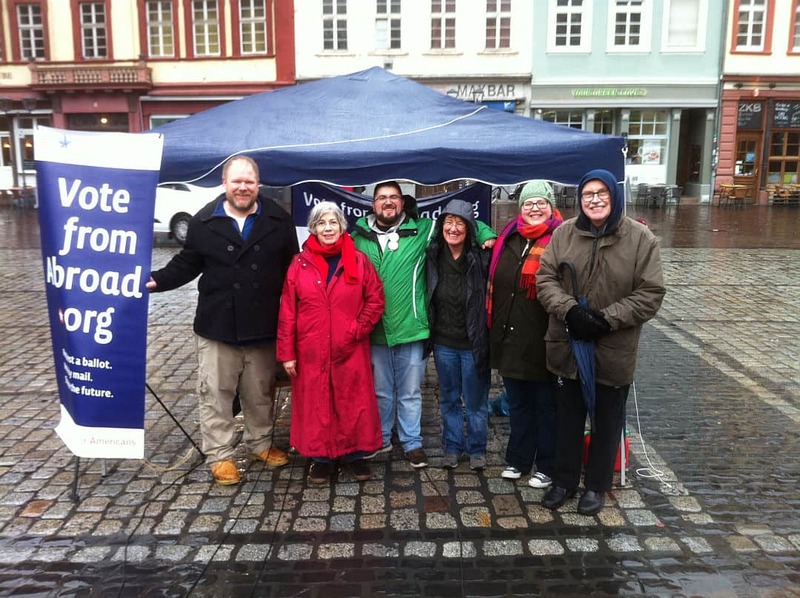 Members of our Heidelberg Chapter at our GOTV (Get Out The Vote) table on Bismarckplatz. We helped some overseas Americans with information about requesting their absentee ballots, and we could request and print out a ballot request for someone right on site with our tablet and portable printer! Also, the chocolate chip cookies were a hit. 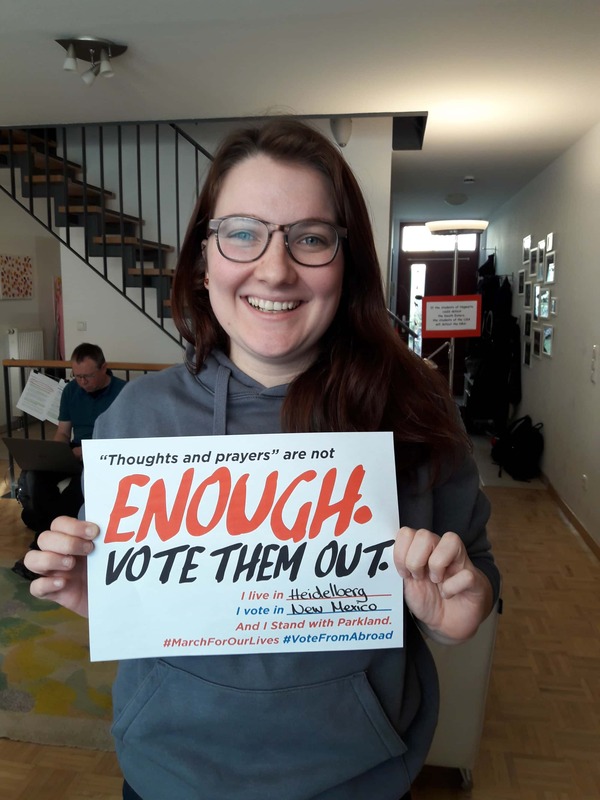 Our next GOTV table is going to be at the Bunsendenkmal (Hauptstr. 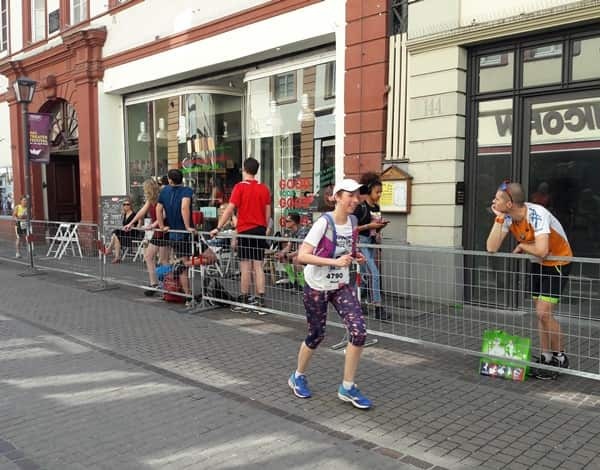 47-51) on the pedestrian zone June 9th. Come on by and say hello. Oh, and if you have not done so already, please request your absentee ballot at www.votefromabroad.org ! Half-Marathon Fundraiser was a Success! 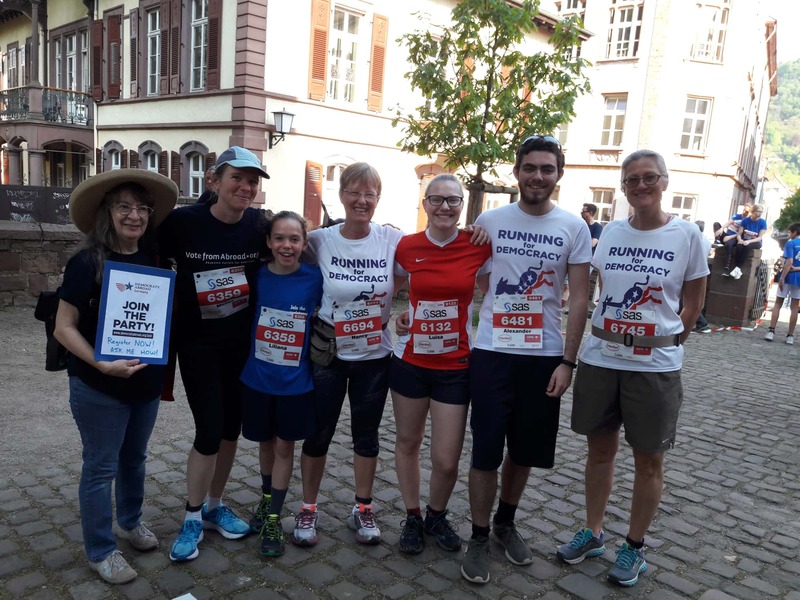 Our DA Heidelberg Teams ran in both the Half-Marathon and the 3.1 K Team runs to raise awareness of and money for Democrats Abroad Germany. 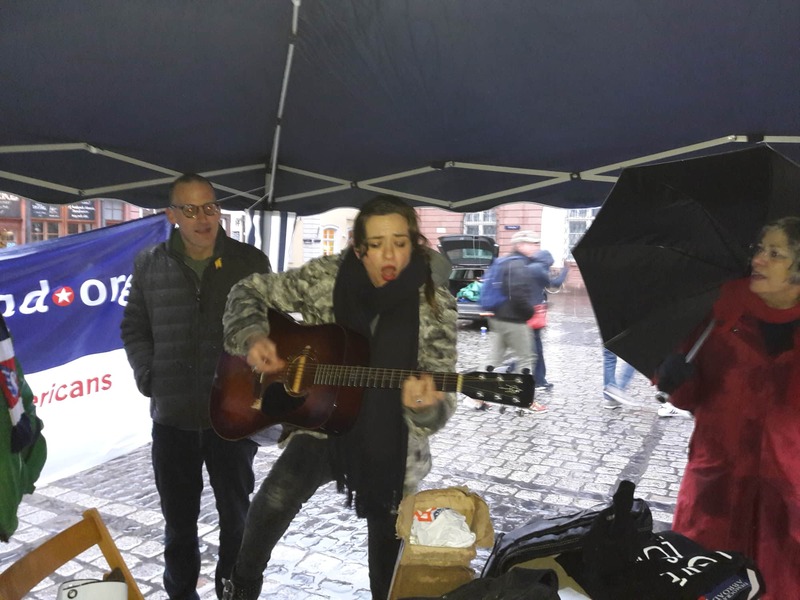 We raised over 700 Euros! Thank you to all the donors. Thanks to everyone who came out and supported us. Thanks to Irisita and the Carpenters (sounds like a band) for making great signs. Thanks to all the 3.1 K runners: Xander, Luisa, Charles (not pictured), Katie, Melisa and 9-year-old Liliana, and a HUGE thanks to Mandi Larsen and Niki Vonderwell, who ran the Half-marathon! 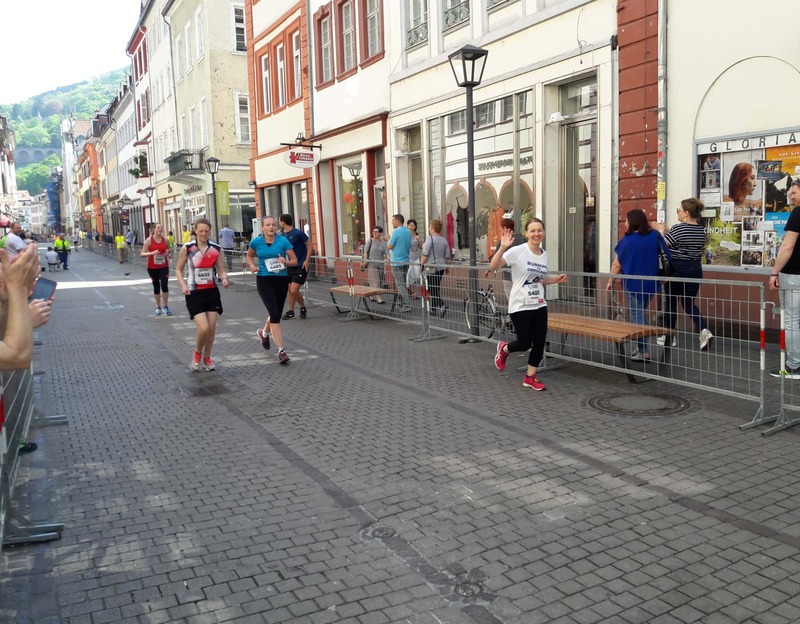 This is one of the hardest half-marathons in Germany, with one uphill part 4 K long, and temperatures got up to 29 degress Celcius. 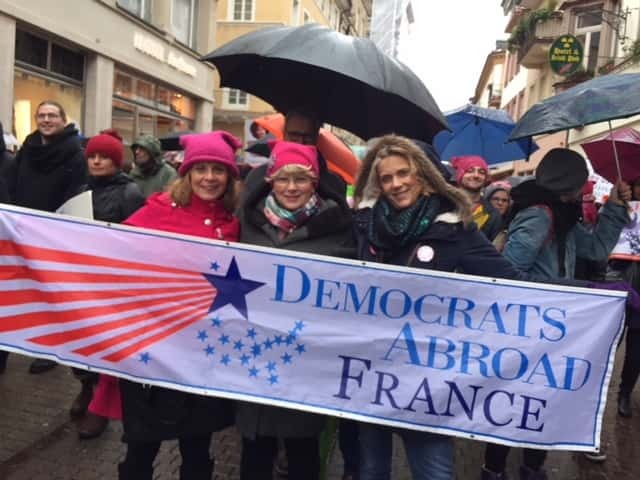 Democrats Abroad Heidelberg rocks! 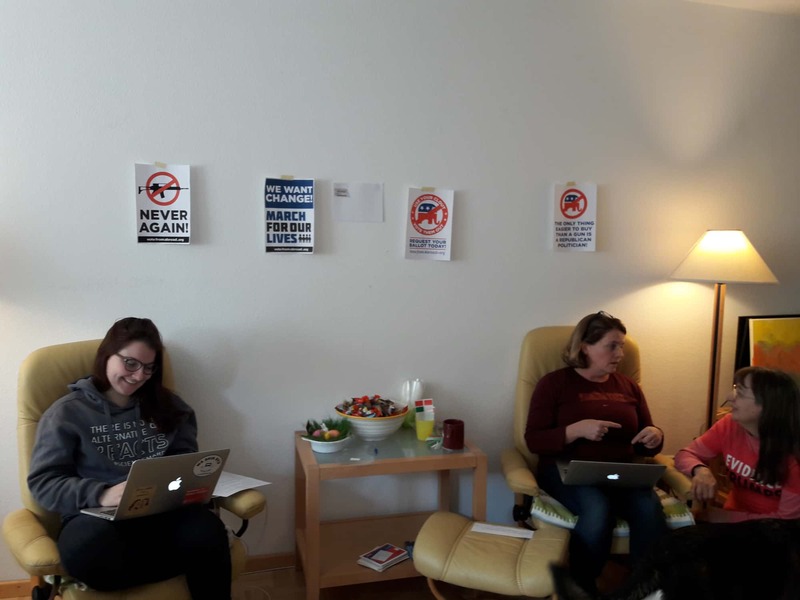 Our Virtual March For Our Lives event in Heidelberg was a success!! 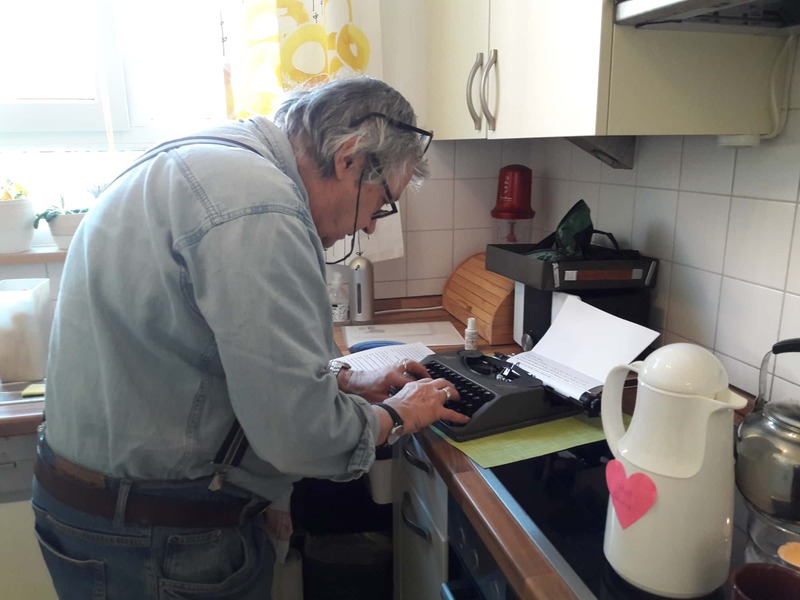 We were 21 people who met for a few hours on Saturday afternoon, the 24th March, with our laptops, tablets and even a typewriter. 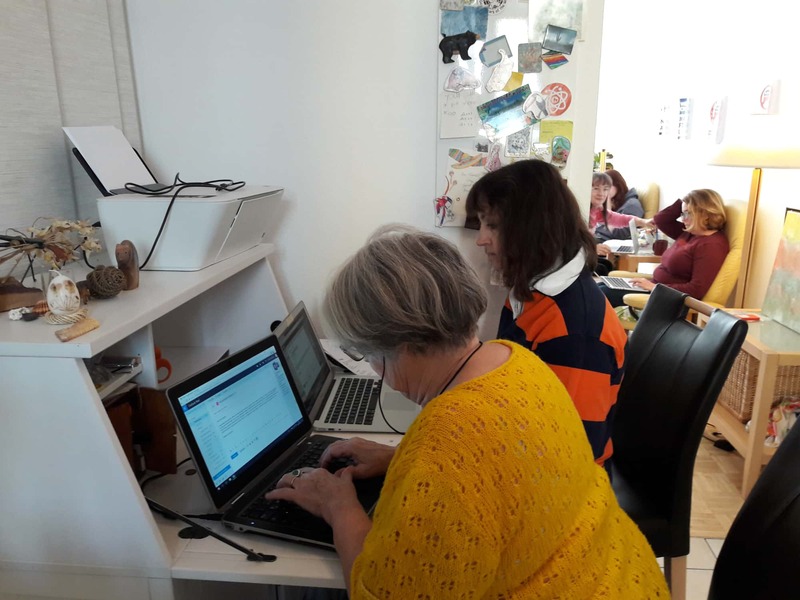 Together we wrote about 250 emails (plus 3 typewritten letters!) to our Members of Congress, encouraging them to vote for sensible gun laws, and we also wrote to businesses, either thanking them for standing up to the NRA, or shaming them for standing with the NRA. Many thanks to Irista Azary and Roger Lee for hosting the event, and especially to Irisita for the idea in the first place! Thanks to all the people who came to make their voices heard, particularly the young people. 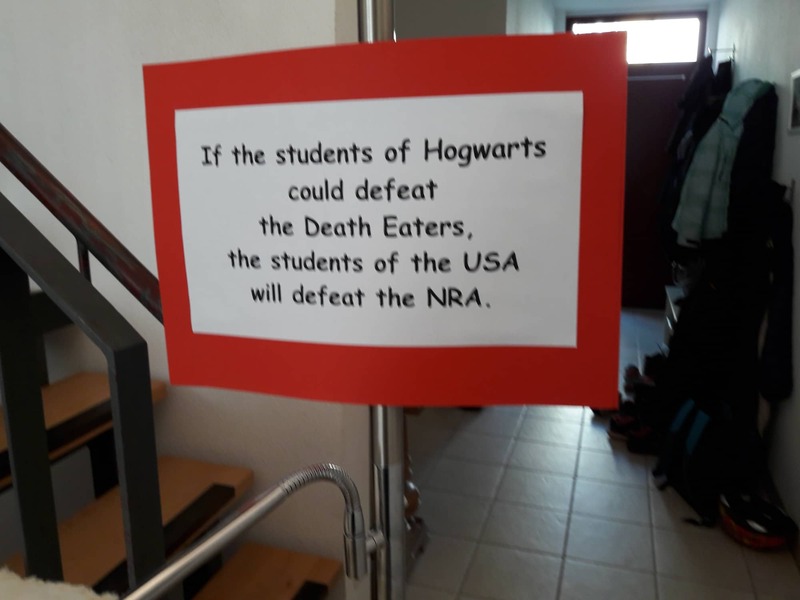 Thanks to those who brought snacks, and hotspots. We were one of 844 events across the globe. I think we should be proud that we both stood up to be counted in solidarity with all the other marches and events, and already took the next step with focused action. 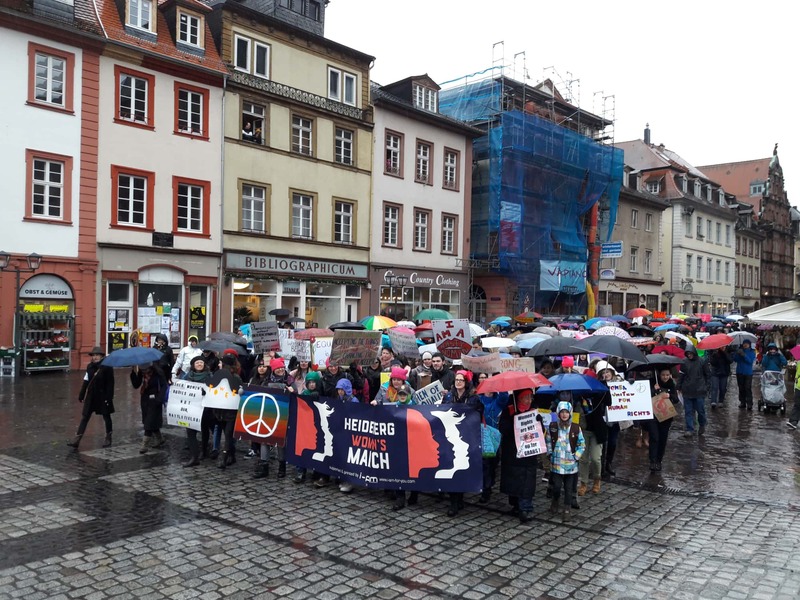 The Women’s March in Heidelberg attracted marchers from far and wide, with nearly 500 in total turning out. 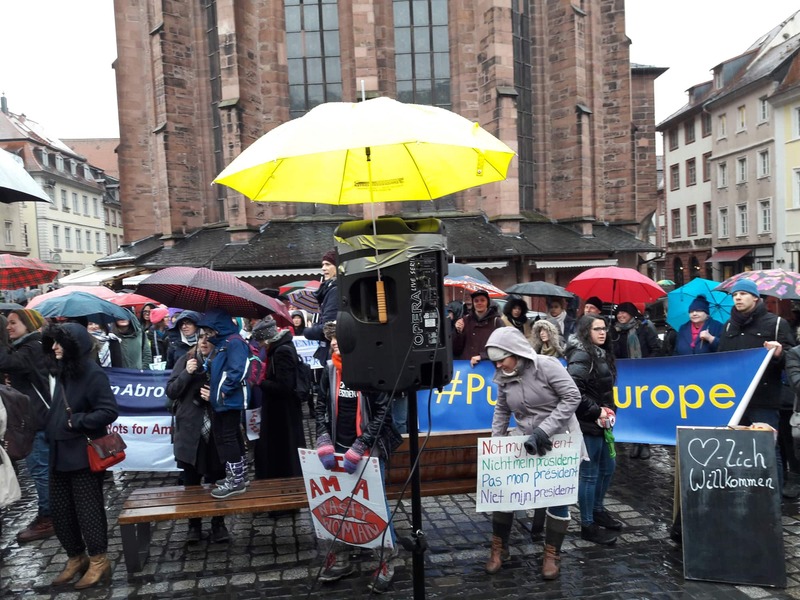 The cold rain didn’t dampen spirits. On the contrary, spirits were high and motivation to stay engaged was even higher. 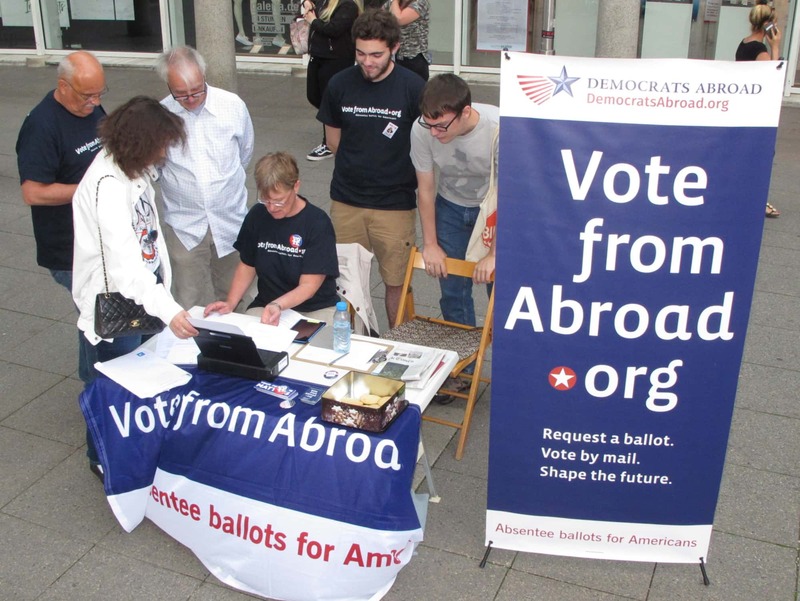 The March marked the beginning of this crucial election year as Democrats Abroad seeks to have as many overseas U.S. citizens as possible request their absentee ballots. Be sure to request yours if you haven’t already at www.votefromabroad.org. 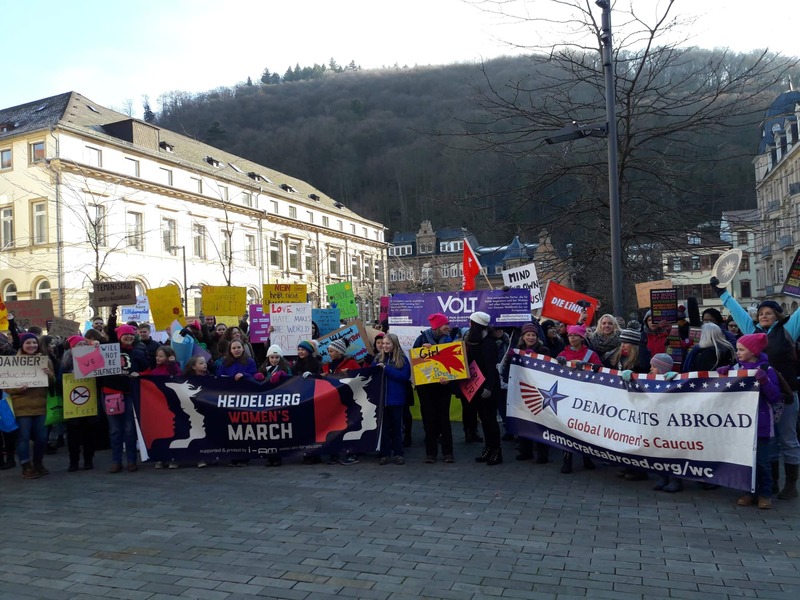 Here are some of our photos from the Heidelberg Women’s March.